Rain chains are—in essence—art with purpose. They provide a beautiful, interesting alternative to traditional downspouts. With a long and diverse history, rain chains have been a part of Japanese life and culture for hundreds of years. They are often used to collect water and deposit it into a barrel for household use. Also, it is not uncommon to see ornate versions displayed in Japanese temples. In remote areas of the world where machined parts are a rare commodity, rain chains provide an accessible method of harnessing and collecting rainwater. Rain chains come in three varieties: link, cup, and a hybrid style. They range from basic to ornate, decorative, and themed varieties. The link style is closest to the original, but there are some important factors to consider before deciding on one. Link chains tend to splash, especially during heavy downpours. 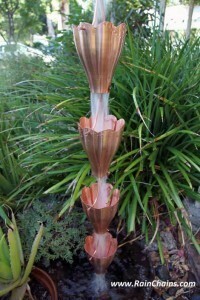 If you are shooting for an active, vibrant water feature with a musical quality—this is a plus! However, you may want to avoid placing them near doors, windows, or other areas where someone might get involuntarily damp. With their clean lines, link chains complement modern architectural designs nicely, but they can work in more rustic settings as well. Cup chains veer away from the traditional style, but surpass link chains in performance and efficiency. Each cup has an open bottom that funnels water down along the chain—significantly reducing splashing and opening up more placement options. 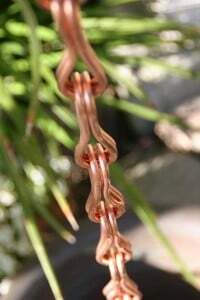 Rain chains are made with various different metals—including aluminum, stainless steel, and copper. 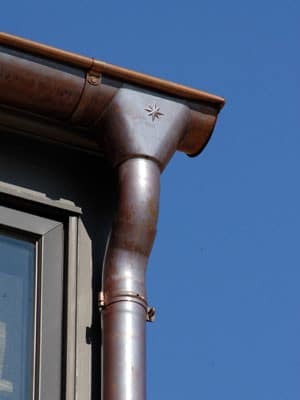 Copper is a popular choice for its unique look, durability, and ease of care. 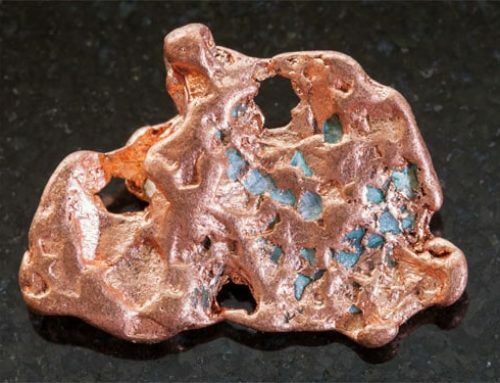 Copper does not rust and is highly resistant to corrosion. It is a long-lasting metal that is full recyclable and can be worked at any temperature. 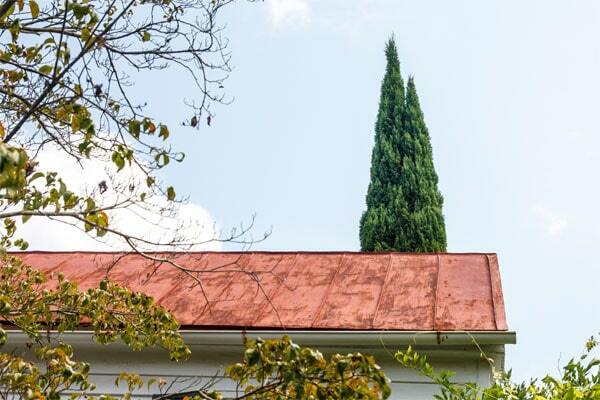 Perhaps its most intriguing feature is the protective coating that develops during the oxidation process—patina. 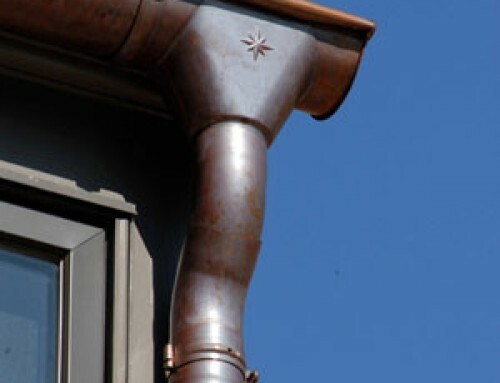 This coating protects the metal from corrosion and gives it an elegant, stately appearance. 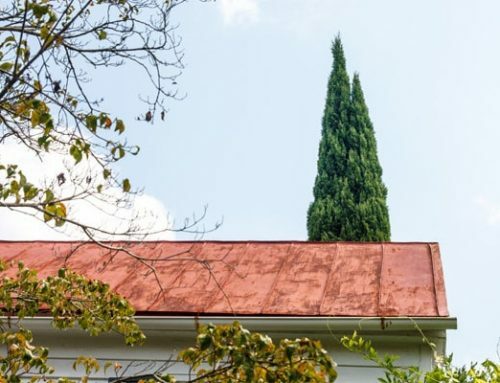 It is worth mentioning that if you wish to preserve the natural look of the copper, it will need to be treated with a sealant. Traditionally, Japanese households place a stoneware or ceramic vessel beneath the chain to collect water and create an elegant display; however, there are a wide variety of options for catching the water. For a natural look, construct a square with redwood or cedar and fill it with river stones or gravel. If it is frequently damp, moss will grow between the rocks over time. For a simple solution, place a paver tile or a few medium rocks to disperse the water flow. Most nurseries and home improvement stores carry basins or saucers for catching rain water. Installing a rain chain is fairly simple. 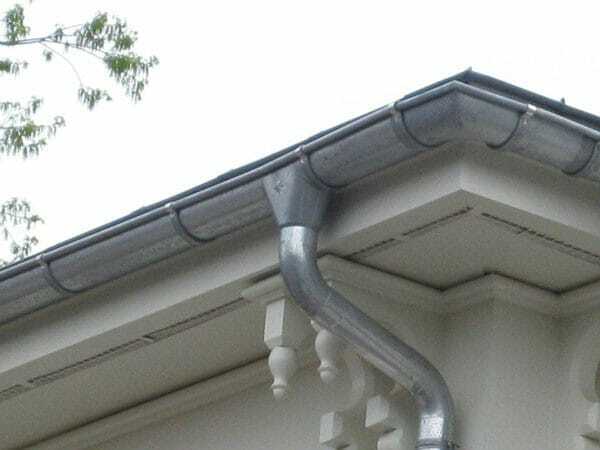 It fastens directly beneath the gutter, using an attachment piece, where the downspout would have been placed. Sometimes, the hole is larger than the chain and a special adapter kit is needed to decrease the size of the hole and focus the water down into the chain. Rain chains are a distinctive way to eliminate the loud, clunky noise associated with traditional downspouts. With their unique look and gentle sounds, they add personality and tranquility to your home. 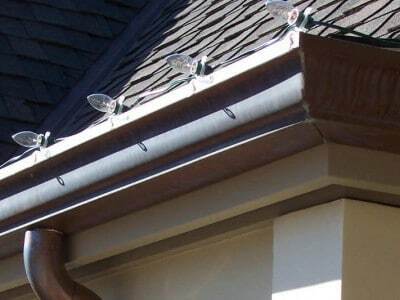 Conact Kobett Metals today to learn more about rain chain styles, pricing and installation.